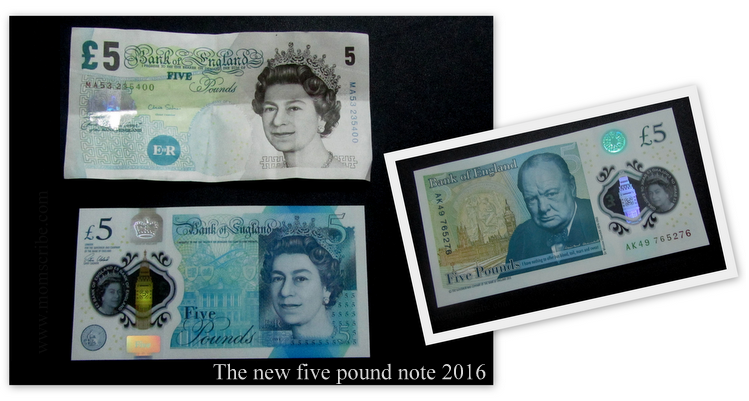 Home » new five pound » polymer money » The New Five Pound Polymer Note 2016 - the Plastic Money finally! The New Five Pound Polymer Note 2016 - the Plastic Money finally! 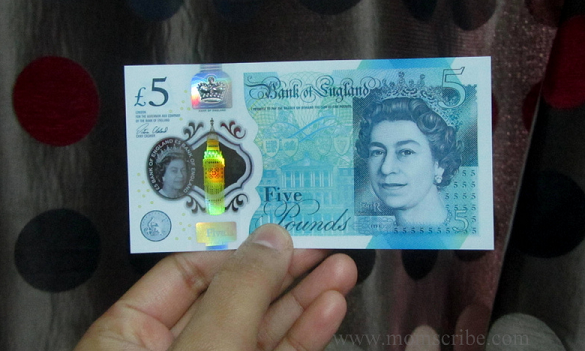 I was eagerly waiting to see and hold the new fiver plastic money on my hand when I read about it release on 13th September 2016 by the Bank of England. Luckily today, I got to feel how it is to hold the talked about plastic money in my hand. It had the feel of the paper and plastic at the same time. The bold letters and numbers in dark blue printed on front side of the fiver can be felt easily in hand because of its raised printing. Compared to the old £5 note, the new five pound note looks smaller, fresh, not easily torn or crushed and in fact had more security features to tackle counterfeit notes. The front side of the new fiver features the face of the Queen Elizabeth II of the United Kingdom in full view facing left and the back side features Sir Winston Churchill (1874-1965) image, the former British Prime Minister and the only one to win the Nobel Prize for literature. You can also see his famous quote underneath his image and the his birthplace Blenheim Palace printed on the background. Another noticeable feature seen with all pound notes released by the Bank of England is the sign of the Chief Cashier. The new fiver has the signature of the current chief cashier Victoria Cleland on the front top left of the bank note. Ah, it feels good to write and share details about the new fiver. Finally, the first plastic money (future money) that I held in my hand today. One of the noticeable security feature that highlights the fiver is the see-through window with a portrait of the Queen on the left side and a foil picture of Elizabeth Tower or Big Ben which is gold on the front of the note and silver on the backside. This is exactly where you can feel the plastic (or polymer) of the new five pound note. You can also notice that the border of clear window under which the Big Ben is printed is made of green colour along with green pound symbol inside it. The easily recognisable Queen's cypher EIIR (standing for Elizabeth II Regina) seen in turquoise circle on the front of the paper five will be seen under the image of the queen in the new fiver. From this month that the old paper five pound note and the new five pound note would circulate together until next year, 5th May 2017 with the old one being gradually removed until the date specified after which they will cease to be legal tender and will no longer to accepted. Next in line is the £10 to be printed in polymer in the year 2017 featuring Jane Austen, followed by £20 featuring J.M.W. Turner by the year 2020. So where can you get a new fiver in UK? Mostly, the ATM cash machines and bank counters is where you can get the new fiver quickly. Other than that, the post office and if you are lucky, you can get one from your local retail shop. The new fiver will be in your hands in no time as it gets circulated fast. You can get more details of the new fiver website by the Bank of England.